I’d never been to Akasha in Culver City before, but this was certainly a great experience to start me off on the right foot of hopefully more trips back. My curiosity has been piqued on this corner resto all thanks to the opportunity to attend a special beer dinner featuring Unibroue beer. I had been at a tequila tasting at El Carmen* before at which 4 Copas was represented, and it was actually one of my favorite tequilas of the night. It’s organic, very clean and refined tasting – and is reason enough to completely discount our experiences with Jose Cuervo that are so often unfairly tied to too many perceptions of tequila. It’s a good vodka that really translated the opposite ends to which the cocktail went – jalapeno spiciness (it could make your nose run) yet having the refreshing element that is cucumber. 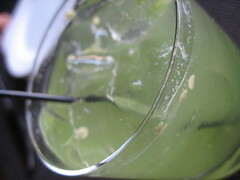 Agave gave it just the right amount of sweetness to make it a palatable drink. For the Unibroue beer dinner, we were joined by pleasant company Joshua of FoodGPS and Anna Roth and were content to get on with the feast (when you peep Niman bacon wrapped scallop on the menu, there’s no time to wait around – but more on that soon). We started off with a simple grilled pizza bread topped with Tumalo Farms Pondhopper – a microbrew-enhanced goat cheese. Unibroue’s Blanche de Chambly White Ale that paired with it was quite refreshing. That Unibroue specializes in refermentation is consistent with the champagne-likeness of the brew. I was glad to add Unibroue to my craftsman beer experience. And then the bacon-wrapped scallop was next. 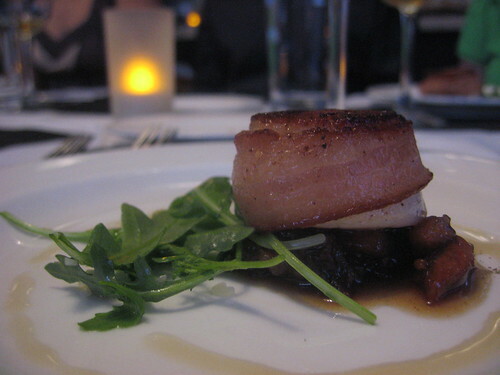 Accompanying the bite was an apple & onion chutney in a carmelized beer reduction which made a sweet addition to the salty-seafood combo that was the bacon and scallop. Too delicious!! Bacon-wrapped scallop anything really, but this was a refined dish with chutney. 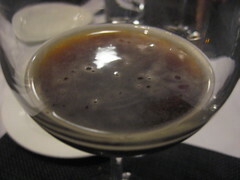 The Ephemere Apple Ale made from pressed apple must paired with the scallop was nothing short of a match. There was an organic lolla rossa salad next, with duck confit and grilled nectarines topped with spiced walnuts and a walnut citrus vinaigrette. The La Fin Du Monde Tripel Unibroue beer has â€“ you guessed it â€“ triple the amount of alcohol and was a spicy complement to the indulgent, sweet element of duck and nectarine. 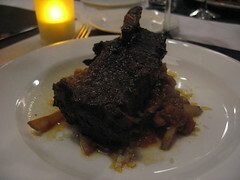 But my eye had been fixed on the beer braised pepper crusted short ribs for the entire menu, now. It was set atop â€œpoutine style housemade friesâ€ with aged cheddar and carmelized carrots â€“ and I get that the housemade fries may have been glazed but there was no gravy nor cheese curds as a poutine should. The sweet carrots were nice, though, and when you have a black ale paired with it it just accentuates the richness of the short ribs more. Definitely a tasty dish and I found myself enjoying the straight-forwardness of the Chambly Noire. I was so sad that I had to leave for a concert around the time the dessert was coming out. 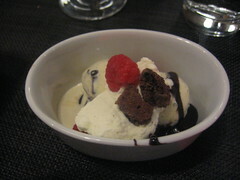 Luckily, I was able wolf down a few spoonfuls hot fudge goodness that was the dark chocolate chip ice cream sundae. The Trois Pistoles Strong Dark Ale that was paired with it went untasted as I scooted out the door.Â The sundaeÂ was accompanied by a goji berry chocolate biscotti (a nice salty surprise) but as with any chocolate I think the raspberries were a great topping to the fudge. Akasha did a great job on the pairings and pulled its weight in complex food to complement the brews. I can’t wait to come back for just the food, itself. But in the meantime, stay tuned for details on the next beer dinner on August 18th. * El Carmen (at 8138 W. 3rd St. 90048) tequila tastings are held quarterly, cost $25 for 3 hours including passed appetizers and water. Typically around 15 tequila vendors are there to let you try their agave goodness. To get on the list for the next one, contact megang [at] committedinc [dot] com. 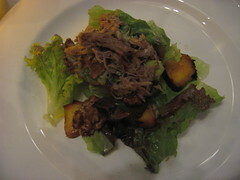 This entry was posted in Culver City, Food and tagged Akasha, beer dinner, Culver City, Unibroue. Bookmark the permalink.